John Barrett of ON Partners (www.onpartners.com), a leading retained executive search firm, has compiled the results of the quarterly Digital Jobs Index. 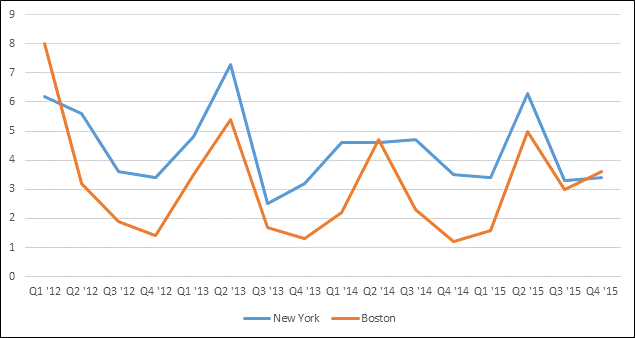 Hiring remains steady in both Boston and New York City. For the year, Boston came roaring back with its strongest hiring since 2012. New York, on the other hand, experienced a softening hiring environment in the latter half of 2015 and had its weakest year since our survey began in 2012. 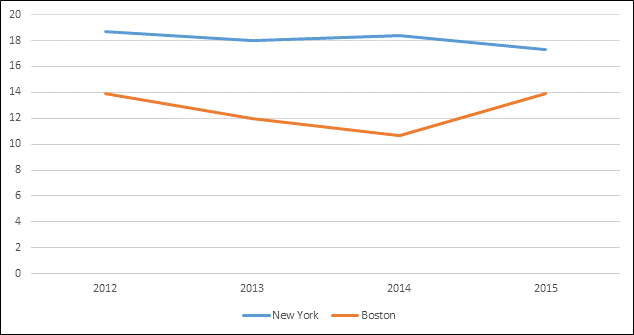 Overall, the hiring pace in New York still easily surpasses Boston's. The strength of Boston's success lies in the continued binge hiring of a few dominant employers: Wayfair, Amazon, HubSpot, Google and DraftKings. Wayfair, HubSpot and DraftKings are homegrown success stories. The make-up of New York's hiring eco-system is quite different: much more of the digital hiring in the city comes from companies that aren't even headquartered there such as Google, Amazon, Facebook, LinkedIn, Indeed.com and Yelp. New York's hiring is much less concentrated in a few companies which arguably means it's still a far healthier environment that offers many more employment options for digital talent. Full results of the survey are published below. ON Partners surveyed only pure-play Internet and digital companies. Based on its research, the company believes that the businesses surveyed represent more than 90 percent of the Internet and digital employees in New York and Boston. Major digital sub-sectors covered include consumer Internet, small business Internet, advertising technology, consumer payments and marketing automation. Excluded from the survey were digital-focused employees of "traditional" companies and digital ad agencies. ON Partners continually adds or subtracts companies for inclusion in the Index based on the criteria of employing 10 or more employees in either the New York or Boston metropolitan areas. ON Partners' Digital Jobs Index is current as of January 1, 2016. We're more than just headhunters. We've assembled the best recruiters in the industry for one unified purpose: to recruit top talent that delivers results for our clients. With a primary focus on the technology, life sciences, industrial, and energy / clean tech industries, ON Partners (ON) identifies and recruits the best C-Suite, Board and senior executive talent for both public and private companies, as well as venture capital and private equity firms.